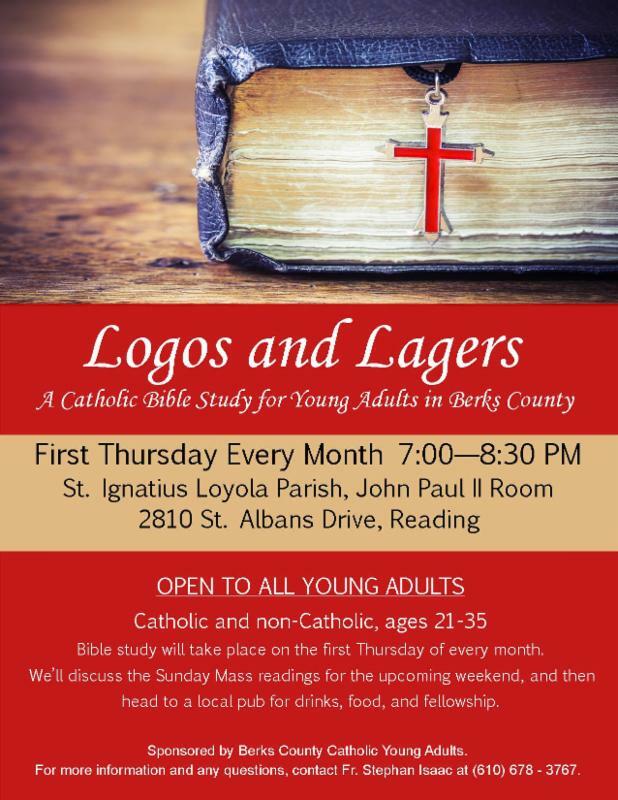 Join us for a new Catholic Bible Study for Young Adults in Berks County! WHO: Young Adults of Berks County (ages 21-35), single and married, Catholic and non-Catholic. The Bible study discussion is normally led by Fr. Steve Isaac, the assistant pastor of St. Ignatius of Loyola Church. WHAT: A new Catholic Bible Study consisting of a reflection and discussion of the upcoming Sunday Mass readings. WHEN: The first Thursday of every month from 7 – 8:30 PM. WHERE: The John Paul II Room inside St. Ignatius Loyola Church (2810 Saint Albans Drive, Reading, PA). After the Bible Study ends at 8:30 PM, we’ll go to a nearby restaurant or pub for drinks, food, and fellowship. Feel free to bring other Catholic books and study Bibles that may complement and contribute to our discussion! Come and meet other Catholic young adults from Berks County and join us for a fun, informative, and engaging discussion of Sacred Scripture, as well as some drinks and fellowship afterwards! Bring friends and spread the word! If you’d like more information or if you have any questions, please contact Fr. Isaac at sisaac@allentowndiocese.org or at 610-678-3767, Ext. 12. To receive updates from Logos & Lagers, follow their Facebook page HERE.